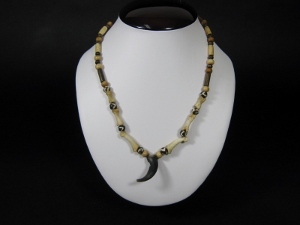 These beaded necklaces are made with real wolf claw and bone. They have black painted and brown round beads, long wooden beads and drilled bones measuring 1 to 3 cm long. The claw pendants measure 4 to 5 cm long on the outside curve. It is 53 cm long, and weighs 27 grams.